A Heaping Helping! The Eating Contest! There’s a special event for “Family Day” : A huge eating competition! Chouji and Chou – Chou participate in a huge eating competition as a family! However, the sponsors of contest have a certain trick prepared for them!? S01E02 - The Hokage's Son! S01E03 - Metal Lee Goes Wild! S01E04 - A Ninjutsu Battle of the Sexes! S01E05 - The Mysterious Transfer Student! S01E06 - The Final Lesson! S01E07 - Love and Potato Chips! S01E08 - The Dream's Revelation! S01E09 - Proof of Oneself! S01E10 - The Ghost Incident: The Investigation Begins! S01E13 - The Demon Beast Appears! S01E16 - Crisis: The Threat of Failing! S01E25 - The Turbulent Field Trip!! S01E29 - The New Seven Ninja Swordsmen!! S01E32 - The Quest For Souvenirs! S01E33 - The Super Beast Scroll Slump!! S01E35 - The Parent Teacher Conference! S01E36 - The Graduation Exam Begins! S01E37 - A Shinobi's Resolve! S01E38 - Formation of the Three Man Squad? S01E40 - Team 7: The First Mission!! S01E42 - A Ninja's Job! S01E43 - The Byakuya Gang Surfaces!! S01E48 - The Genin Documentary! S01E55 - The Scientific Ninja Tool! S01E58 - The Tournament Begins!! S01E67 - Super Chocho Butterfly Mode!! S01E68 - Super Chocho Kiss Mode!! S01E69 - Super Chocho Love Upheaval!! S01E74 - The Enemy, Ino-Shika-Cho! S01E77 - A Fierce Enemy, Garaga’s Ferocious Attack! 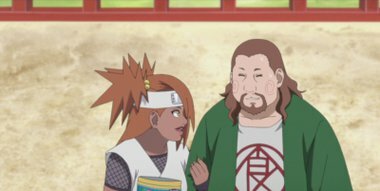 S01E82 - Infiltrating The Hidden Stone Village!! S01E94 - A Heaping Helping! The Eating Contest!